I love Newbury. Not only does Sue live here, but the Atkinson Retreat Center of the United Church of Christ (above) is here. I have attended only one retreat the year that I attended the Vermont Academy of Spiritual Training in St. Johnsbury. The weekend I spent there was wonderful and the food was just outstanding. It was so hot when I was there but they provided a fan. There were hymns, prayers, discussions, and community. It all made me feel loved and part of a community I had always wanted to be a part of. The section between the house and the barn is like a dormitory with small cell-like rooms that make me think of a monastery. I will be going to another retreat in April with the conference's Women's Fellowship. I can't wait! Perhaps this time I will see the ghost that they claim inhabits the house! The Newbury store (above) is a great place for muffins, cookies, DVDs and gifts. It is one of the friendliest stores around. Newbury has a more colonial-era type of atmosphere which is so familiar to me from Connecticut. It was established in the mid-1700s. Barton, where I live now, is younger, poorer and more remote. Hall's Lake is also in Newbury. Sue, Wingnut, and I went swimming and canoeing there last summer. 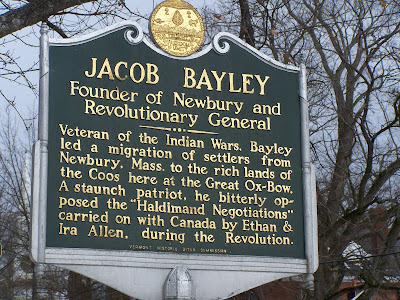 Veteran of the Indian wars, Bayley led a migration of settlers from Newbury, Mass. to the rich lands of the Coos here at the Great Ox-Bow. A staunch patriot, he bitterly opposed the "Haldimand Negotiations" carried on with Canada by Ethan & Ira Allen, during the Revolution.